The NAB Show is in full swing in Las Vegas, and the SVG editorial team is out in full force, covering all the latest news from the show floor. In an effort to make the tidal wave of news and announcements more digestible to our readers, SVG is providing a daily “SportsTechBuzz at NAB 2017” roundup. This daily rundown provides snippets of big announcements and what is on display at more than 150 booths at the LVCC this year. Here is today’s SportsTechBuzz roundup, featuring news from the show floor. This edition features AJA, Aveco, Bexel Broadcast, Black Box, Blackmagic Design, BlueFrame Technology, Calrec, Clear-Com, Cobalt Digital, Crawford Media Services, Dalet, DiGiCo, Ericsson, FileCatalyst, G-Technology, Haivision, LTN Global Communications, Panasas, Panasonic, Pliant, Primestream, Pronology, Riedel, Sanken, Sennheiser, Simply Live, Spectra Logic, Studer, Thinklogical, Timecode Systems, The Video Call Center, TVU Networks, Utah Scientific, VOGO, Wowza Media Systems, wTVision. Bexel Broadcast (Booth C6025) promised it would expand its Clarity camera line, and that is exactly what it has done. Showing off the Clarity 400, which is half the size of the earlier 800 model and can shoot up to 240 fps at HD or real time at 4K, Bexel’s Craig Schiller noted, “We also have the 800R, so a ⅔-in. lens can be put on it because we know people will want to start to pan and zoom,”. A foosball table helps Calrec show off its effects mics. 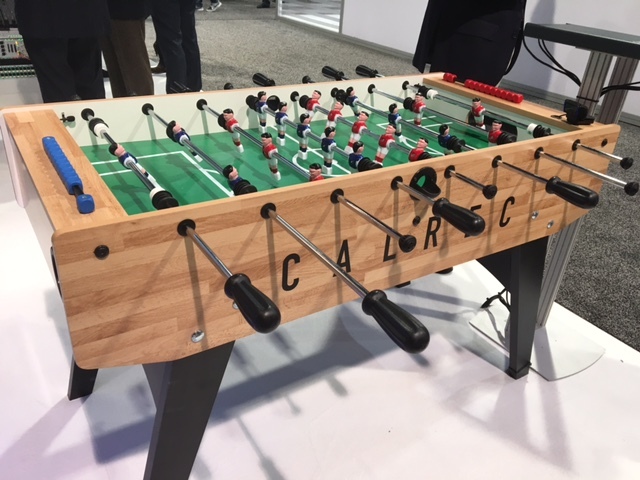 A regulation foosball table at Calrec’s booth (C3118) was set up with four lav effects mics feeding a Calrec Fieldbox and then to the new RP-1 rack-mounted console, Calrec’s entry into the at-home/REMI race, that sent the signals by Cat 5 to an Apollo console, emulating an OB van to studio setup. Fun, but the star of the show was the new entry in the Artemis series, Artemis Ray, which puts yet more faders into an even shorter desk and can add a full-motion video player into the chassis. Clear-Com’s (Booth C6908) recently released LQ-Series interfaces — which can connect two-wire, four-wire and four-wire with GPIO audio and call signaling over IP networks — have added GPIO (general-purpose I/O) allowing control information to accompany audio. This increased functionality makes the LQ better-suited to at-home/REMI production, according to Product Marketing Manager Vinnie Macri. CrewCom, Pliant’s (Booth C12721) wireless production intercom system that supports simultaneously active 2-wire and 4-wire intercom connections, has added a new feature: a sync port allows the multiple users to operate multiple CrewCom systems simultaneously and with no RF conflicts. DiGiCo’s (Booth C3118) new SD12 console made its NAB Show debut, with 72 I/O channels each with full processing. Meanwhile, the company’s SD7 flagship console now sports 250% faster processing, thanks to new DSP. Microphone manufacturer Sanken (Booth C3851) showed its array of high-rejection shotgun mics, including the 7-in. CS-1e. But distributor Plus24 President Jim Pace recalls the 2003 NHL All-Star Game in Tampa Bay when Sanken really showed its sports stuff: the league allowed 15 contact mics to be frozen into the ice, where they were able to pick up stick, blade, and even the PA sound without ambience. “The entire rink became a membrane,” Pace points out. In-venue–video folks looking to deliver replays and more to digital devices will want to check out VOGO, on display exclusively at the Panasonic booth (C3607). Panasonic’s Mike Bergeron says the app from the France-based company allows easy delivery of camera signals to devices where users can then choose different angles, replays, zoom, and more. Riedel launches the Belero wireless intercom system. 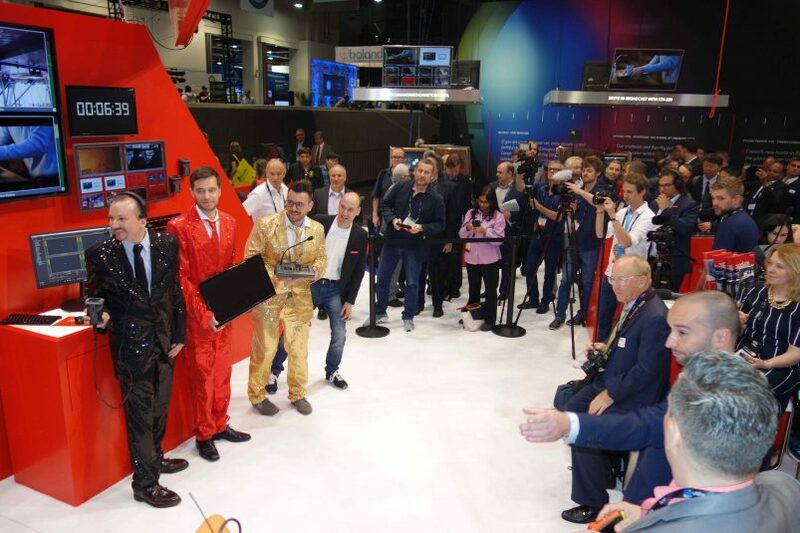 Riedel (Booth C4337) used a press conference to formally launch Bolero, a new wireless intercom product. The 1.9-GHz DECT system uses decentralized antennas running over a standards-based AES67 network. The antennas connect to switches that connect to AES67 client cards in the Riedel Artist mainframes to provide a fully integrated point-to-point intercom ecosystem with seamless roaming capabilities. Nothing all wet about Sennheiser’s (Booth C2213) new MKE 2 GoPro-verified microphone for HERO4 Black and Silver cameras. You’ll find it in a water tank at Sennheiser’s booth and hear a demo that shows how its windscreen keeps it dry and ready for action. 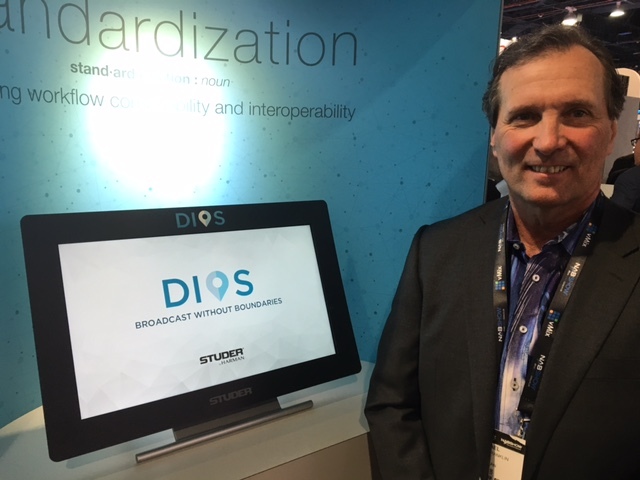 Studer (Booth C146) is showcasing its new DIOS (Digital I/O System) I/O routing-automation software designed to manage and simplify complex routing matrices within broadcast workflows. DIOS key features will help broadcasters increase production efficiency and reduce workflow errors. “DIOS is platform-agnostic and works with any number of third-party consoles and routers,” says Mike Franklin, VP, sales for Studio. Timecode Systems (Booth C2746) has made its already compact solution even smaller by introducing the new UltraSync ONE solution. The device creates an RF-powered timecode and genlock solution offering sync for multicamera, multi-audio shoots, and professional 360-degree VR custom rigs. HJ Rorke says that the company is frequently impressed with customers’ creative ways of using its solution and that there has been a noted rise in using the devices for player/team-performance analysis. The UltraSync ONE measures just 55 x 44 x 17 mm, making it the smallest generator/transmitter in its class. TVU Networks (Booth C3739) CEO Paul Shen says the theme of the show is “efficiency.” The company is showcasing the version 3.0 software update for its popular RPS (Remote Production System), adding the ability to synchronize across multiple unit pairs for additional channels, add a VLAN tunnel in order to connect any IP device between the field and studio, and add support for VoIP. Ericsson (Booth SU720) is showcasing its full range of products and managed services for OTT providers, this fast-growing sector largely driven by live sports production. Product segmentation, data analytics, end-to-end managed services, and options for the monetization of emergent online business models are brought together to provide a platform-based offering for customers, according to the company. 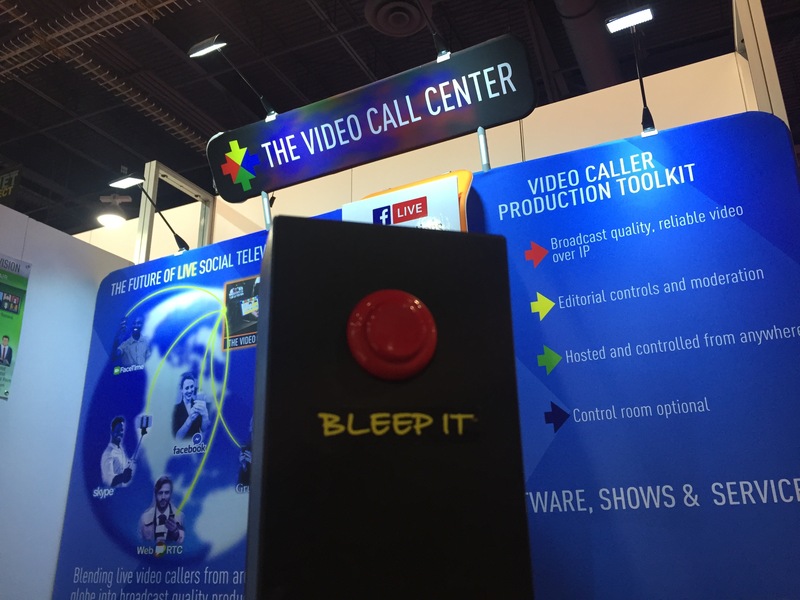 The Video Call Center has added an air-cleaner button (called Bleep It) for hosts using the company’s video-caller platform. The Video Call Center (Booth SU11806) CEO Larry Thaler was excited to show off the latest with his company’s patented video-caller platform that provides the world’s first production workflow using two-way video chat to enable remotes by smartphone and video-caller participation in live television. Among the new additions is the “Bleep It” button, which is essentially a “cough switch” that allows a host to control the cleanliness and professionalism of the broadcasts. Thaler said that, when a broadcaster live-streams, the brand’s credibility and respectability are in the spotlight. The VCC’s streaming broadcasters value their brand and need to be able to protect it. Haivision EVP/CMO Peter Maag (left) with Wowza Media Systems’ CEO/co-founder David Stubenvoll at Monday’s press conference following the announcement of the groundbreaking SRT Alliance. 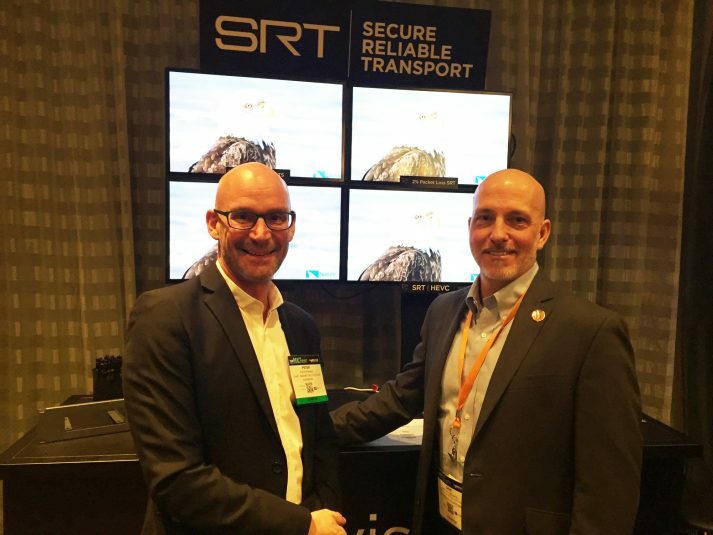 Wowza Media Systems (Booth SU8521) and Haivision (Renaissance Hotel, Deluxe – B) shook up the streaming-video world when they announced formation of the SRT (Secure Reliable Transport) Alliance. The partnership introduces the open-source availability of SRT, a video-transport protocol to enable delivery of high-quality and secure, low-latency video across the public Internet. HDR is on everyone’s mind, and AJA’s (Booth SL2505) FS-HDR converter/frame sync is worth a look for those looking for real-time HDR conversion, says President Nick Rashby: “It does real-time HDR-to-HDR, HDR-to-SDR, SDR-to-HDR, and BT.2020-to-BT.709 color conversion. And the [range] camera inputs are a very powerful feature. Black Box (Booth SL9321) is debuting its newest product, Boxilla, for the first time in the U.S. Boxilla is a KVM and AV/IT system-management platform that provides control rooms with a centralized command center for full monitoring and control of the entire system. It features a new KVM extension solution for postproduction colorists, new capabilities for InvisaPC, and a remote-production solution to improve connectivity for live broadcasting. Blackmagic Design (Booth SL5816) has announced ATEM Television Studio Pro HD, a broadcast-quality all-in-one live-production switcher with integrated hardware control panel. It’s available in May for $2,295. Blackmagic Design also announced DaVinci Resolve 14, which it says is “the biggest release in the history of the product and an update that has been designed to be more than an incremental software update, but a complete revolution in postproduction.” New features include up to 10 times performance improvement, a new audio postproduction suite with Fairlight audio built into DaVinci Resolve, and multi-user collaboration tools that let multiple people edit, color, and mix audio from multiple systems, all in the same project at the same time. Dalet (Booth SL6210) is highlighting a host of new features in its Galaxy orchestration platform and is rebranding Galaxy as an “orchestration system that is more than just asset management and helps manage a variety of workflows,” according to Dalet VP of Marketing Arnaud Elnecave. The new Galaxy features are focused on social media (both analytics and publishing tools), business continuity in the cloud for disaster recovery (DR), and the ability to manage IMF packages at scale. In addition, Dalet has released a new version of its DaletXtend plugin for Adobe Premiere Pro CC. NAB 2017 marks the debut of FileCatalyst Central Version 3.7, which takes many of the workflows and lessons learned in FileCatalyst’s (Booth SL10716) work with NBC Olympics at the Rio Games and brings them to market in the platform. Among the enhancements: the ability to remotely administer all remote locations (users previously had to use several tools) and an all-in-one web console now with remote admin, real-time network health and statistics, and a map showing the entire file-transfer deployment. In addition, FileCatalyst is integrating with object-storage providers OpenStack Swift, Cloudian, and Caringo, as well as highlighting a new integration with Avid MAM. FileCatalyst CEO Chris Bailey also teased development of a consumption-based model for FileCatalyst Direct in Amazon S3 in which users pay by the gigabyte for transfer, instead of buying a perpetual license. G-Technology (Booth SL3824), a Western Digital company, has focused squarely on adding Thunderbolt 3 connectivity to its storage products. The latest G-Drive (available now priced at $699.95 for 10 TB, with 12 TB available next quarter at $799.95), G-Raid (available in June in up to 20 TB and next quarter with up to 24 TB for $1,999.95), and G-SPEED Shuttle XL (available in June in up to 80 TB and next quarter with up to 96 TB for $10,199.95). All products feature Thunderbolt 3. 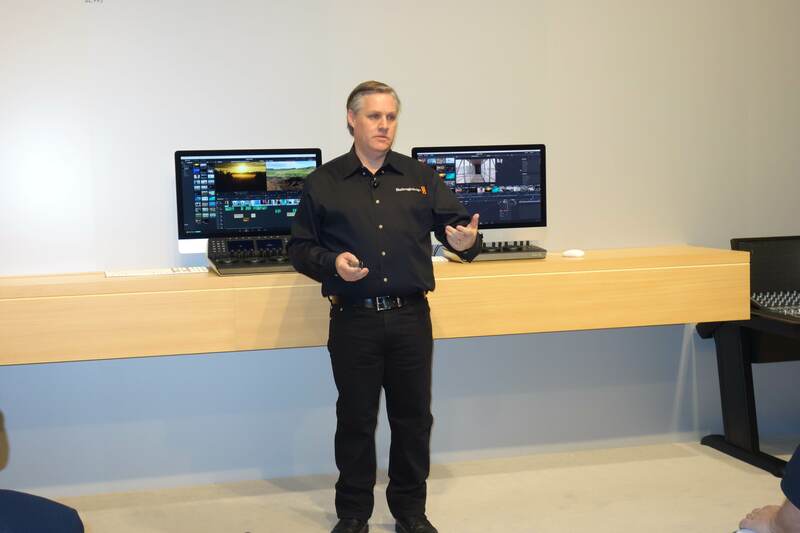 Panasas (Booth SL9724) is demonstrating ActiveStor with DirectFlow for Mac with Axle Video’s media-management software in an acquisition-to-post-to-delivery workflow that the company says illustrates its status as the “Fastest in Hollywood” media-production experience. Other demos include integrations with Adobe Premiere Pro CC, Avid Media Composer, and AWS Elemental. Primestream (Booth SL10216) is illustrating its theme of “Simply Powerful” with the release of version 5.5 of its Dynamic Media Management platform, which encompasses its FORK and Xchange products. Among the highlights are an enhanced user experience, 4K UHD workflow, VR/360-asset management, web-based metadata tagging, an updated Adobe Premiere Pro extension panel with project-centric workflows, and new archival workflows for storing and restoring media from Amazon and SwiftStack object-based storage. Pronology (Booth SL11807), which has seen the use of its mRes multi-resolution encoding system skyrocket over the past two years, is introducing two offerings: Screener and an IP-to-file-based converter. Screener is a multichannel, file-based production screening device that records universally playable MP4 files, while the IP-to-file-based converter features an NDI-to-MP4 conversion feature (with more IP formats and file formats coming soon). Pronology has integrated NDI into its mRes encoder, to be recognizable as a source by other NDI-enabled applications and devices connected to a standard Ethernet local area network. Spectra Logic (Booth SL11816) SVP Hossein ZiaShakeri believes that the company’s BlackPearl converged storage system product is “gaining traction and is poised to explode. “The active-content-archiving system, which combines NAS and S3-based interfaces with multiple storage targets into a simple and affordable solution, now boasts 14 clients designed specifically for M&E (with more clients in development) and developed by Avid, CatDV, eMAM, IPV Ltd., Imagen, Levels Beyond, Marquis, Vizrt, and others. Thinklogical (Booth SL6027) is introducing Intuitive Mouse Control, which enables control-room environments to set up multiple computer displays and use a single mouse across all displays. The company is showing off the system using four computer displays — each showing 4K content and featuring unique audio — to show how the mouse can move seamlessly between the displays without the need for manual switching or interrupting the workflow. wTVision (SL8130) has debuted V5 of its main products (ChannelMaker, Studio CG and FootballStats CG), as well as offered the first public presentation of ChannelMaker-in-the-Cloud, a fully hosted cloud playout system, hosted on Amazon Web Services Infrastructure. Announced last month, ChannelMaker-in-the-Cloud sequences and plays out clips previously uploaded to Amazon Simple Storage Service, mixing them with state-of-the-art 3D graphics overlays and encoding everything to an output stream that is sent to a channel distribution center. From left: Darren Brown, Josh Braun, Chris Knowlton, and Ben Kant hold down the fort at BlueFrame Technology’s exhibit in the SPROCKIT showcase. 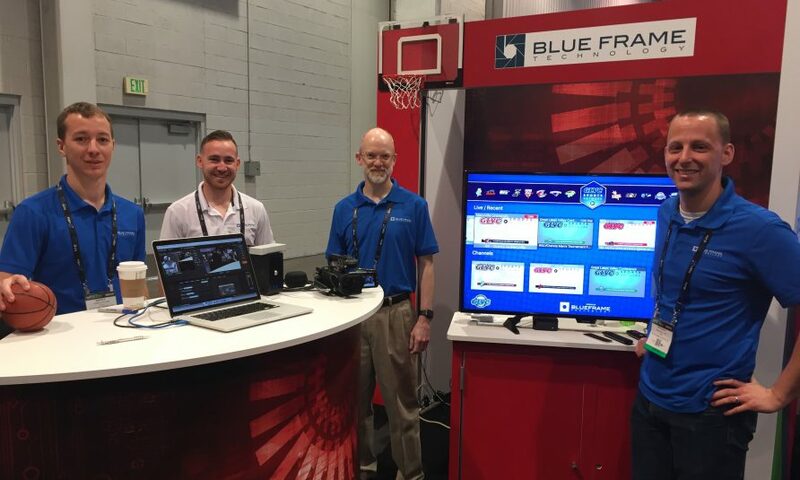 In its second year at the SPROCKIT showcase, BlueFrame Technology (N2739) is putting its Digital Network Platform front and center for sports clients to see. BlueFrame partner Ben Kant believes that the comprehensive OTT platform is the highlight of the company’s work over the past year, and it now boasts added integration with social-media platforms. The company also recently introduced streaming-media veteran Chris Knowlton as the newest member of its team. Knowlton is here in Las Vegas exhibiting with BlueFrame Technology. Simply Live (Booth N1126) is generating some buzz with products like the Vibox all-in-one control-room system for productions with up to seven cameras. Luc Doneux, formerly of EVS, and his team are on hand and walking remote-production professionals through the paces of the next-generation touchscreen production system. Managed IP video-transport pro LTN Global Communications (Renaissance Hotel; 14th Floor) continues to increase its influence in the sports-video–distribution space. The company is showing off LTN Cloud Access, which provides direct access to the LTN network through a fully managed service operated by LTN in multiple regions of each cloud provider. With physical installations of LTN’s appliance at such places as broadcast centers and athletic venues expanding exponentially, Rich Rozycki notes, the company has developed a virtual appliance that allows customers to transmit and receive content from cloud environments. teams: Ken Kerschbaumer, Brandon Costa, Jason Dachman, Dan Daley, David Davies, Karen Hogan Ketchum, and Fergal Ringrose.